Background Monocytes/macrophages are the major immune cells present in synovial tissue responsible for chronic inflammation and joint destruction in Rheumatoid Arthritis (RA). Several proteins involved in inflammation and immune response have been identified in RA synovial fluid (SF-RA). Objectives Aim of this study was to determine the effect of SF-RA patients on surface phenotype, co-stimulatory activity, cytokine production and viability of monocytes. Methods Purified monocytes from healthy donors were incubated with individual SF-RA specimens obtained from twelve RA patients with active knee arthritis and then analyzed by flow cytometry for ILT4 (immunoglobulin-like transcript 4) as inhibitory immune receptor, and CD86 expression, co-stimulation ability, TNFα and IL-10 production, and rate of spontaneous apoptosis. Twelve SF from patients with knee osteoarthritis (OA) (SF-OA) were used as control. Experiments were also performed in the presence or absence of LPS or Adalimumab. Results Surface expression of ILT4 was reduced and that of CD86 increased in monocytes exposed to SF-RA (Figure 1). A significant indirect correlation was observed between ILT4 and DAS, while a direct correlation for CD86 and DAS. The surface phenotype changes induced by SF-RA were associated with increased ability to co-stimulate CD4+ T cells for IFNγ and TNFα production. TNFα and IL-1β response to LPS was increased in SF-RA monocytes compared with OA controls. 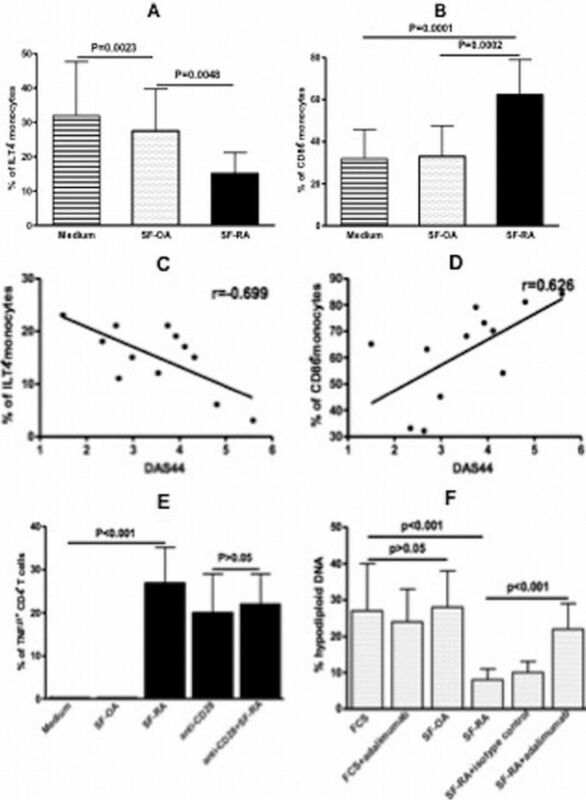 Finally, a reduction of spontaneous apoptosis was observed in SF-RA monocytes, which was strongly reduced by the addition of adalimumab (Figure 1F). Conclusions ILT4 has been shown to exert a negative influence on the stimulatory capacity of APC. Thus, ILT4 exerts a direct influence on innate effectors or an indirect effect on an adaptive response and may play a potential pathogenetic role in RA. Indeed, changes in the relative balance of activating and inhibitory ILTs in the synovium could lead to inappropriate activity of innate immune agents which may drive T-cell activation. Our findings suggest that soluble mediators in SF-RA could contribute to modulate the local effectiveness of the immune response and inflammation.